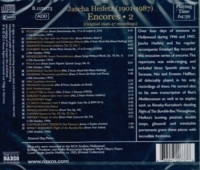 "Over four days of sessions in Hollywood during 1946 and 1947, Jascha Heifetz and his regular accompanist Emanuel Bay recorded this evocative series of encores. The repertoire was wide-ranging, and included three Spanish pieces by Sarasate, Nin and Ernesto Halffter, all delectably played, in his only recordings of them. He turned also to his own transcription of Bax’s 'Mediterranean' as well as to staples such as Rimsky-Korsakov’s dazzling 'Flight of The Bumble-Bee'. Throughout, Heifetz’s bowing, pizzicati, double stops, glissandi and inimitable portamenti grace these pieces with incredible freshness."